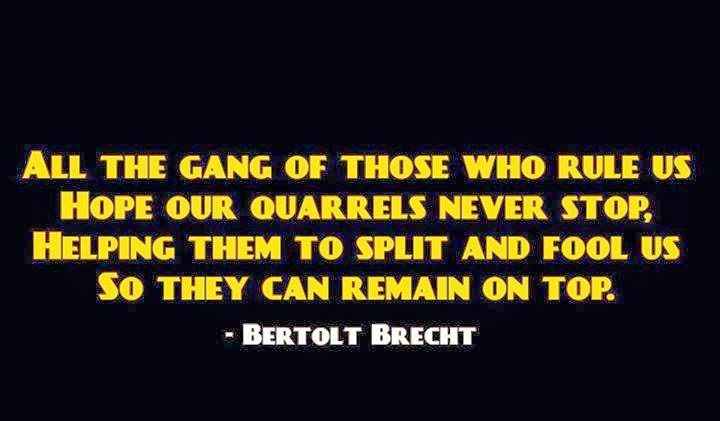 Bertolt Brecht (1898-1956) was a famous German radical playwright. Here’s a link with background information about him. Elections are scheduled in Ukraine for May 25. I don’t know how free and fair the elections will be or whether Ukrainians will have meaningful choices. But it matters little, because the present unelected government of Ukraine has committed the nation to an agreement with the International Monetary Fund that no elected government would ever agree to. It is an example of Naomi Klein’s “shock doctrine” in action. The Ukraine government will sell off national assets at bargain prices, raise gas prices and cut public services as a condition for its loans to foreign banks to be paid off. Yet I don’t read anything meaningful about this aspect in the national press. Here are summaries of what is going on in Ukraine that are better than anything Americans are likely to read in their local newspapers or see on their local TV news programs. Another important aspect of the situation is the desire of certain neo-conservatives in the U.S. government to draw Ukraine into an anti-Russian alliance. Vladimir Putin could not more tolerate the possibility of nuclear-armed American warships docking in Crimea than John F. Kennedy could tolerate Soviet nuclear missiles in Cuba. Economic sanctions against Russia have a price that some countries – for example, Germany – may not be willing to pay..
That doesn’t mean that Ukrainians, including Russian speakers and ethnic Russians, necessarily want to be “rescued” by Vladimir Putin’s Russia. Dmitry Orlov gives a Russian perspective on his ClubOrlov blog. Pepe Escobar of Asia Times has sharp commentary on the geopolitical implications of the Ukraine crisis. Read his articles to get an idea of how U.S. policy seems to the outside world. There are links to the latest from Ian Welsh, Pepe Escobar and Dmitry Orlov on my Blogs I Like page. Who represents the interests of wage-earners? After the election of President Obama, a tiny economic elite is still in charge. Wall Street’s influence on the Democratic Party goes back a long way. And nowadays the so-called progressives represent the views and interests of college-educated professionals rather than those of wage-earners. The Federal Deposit Insurance Corp. has sued the British Bankers Association and 16 of the world’s largest banks for rigging the LIBOR (London Interbank Offered Rate), the rate at which banks supposedly lend each other money. LIBOR matters because it is the benchmark for setting interest rates on many different kinds of loans around the world. Bill Black, an expert on financial fraud, wrote that LIBOR is used for setting interest rates for $300 trillion to $500 trillion in outstanding loans at any given time. The defendants include the three largest U.S. banks, the four largest U.K. banks and the largest banks in Germany and Japan. I can remember when you could find out how much a medical treatment would cost just by asking your doctor. I can remember, as recently as the savings and loan crisis during the first Bush administration, when what Theodore Roosevelt called “the criminal rich class” were subject to prosecution. I can remember when corporations, no matter how powerful, were ultimately accountable to the governments of the countries in which they operated. Whether it is hydraulic fracturing for natural gas, surface mining for coal or processing tar sands for oil bitumen, it is never going to be possible to put the petals back on the flower (figuratively speaking). 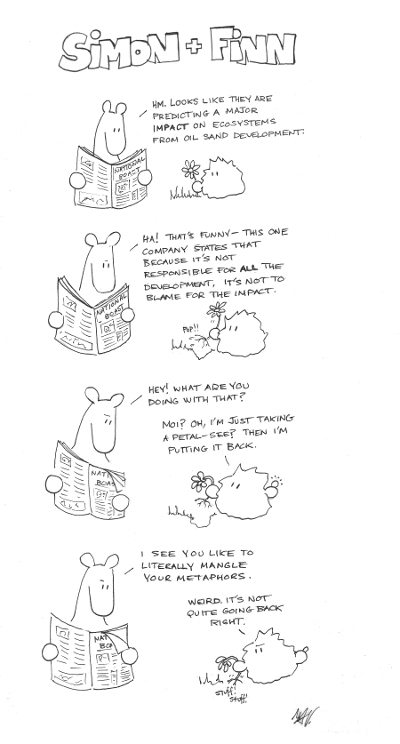 Click on simonandfinn for more cartoons. 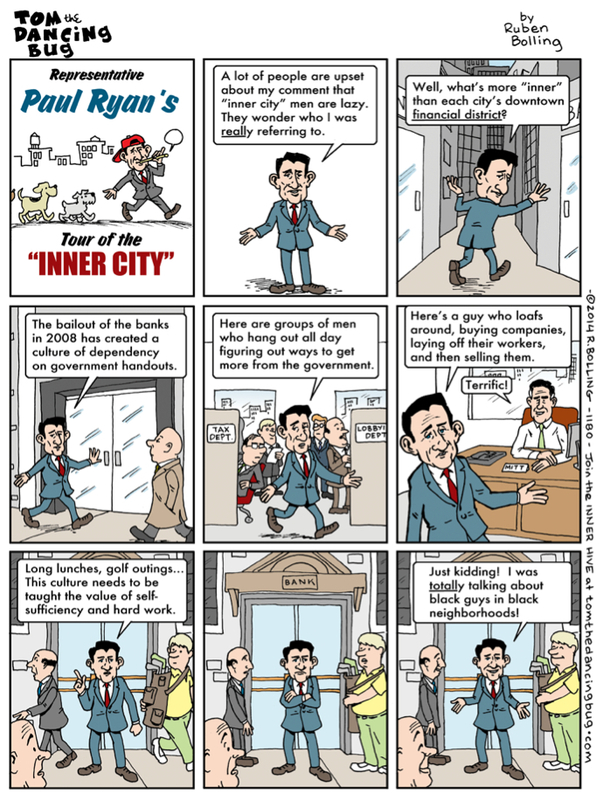 Hat tip for the cartoon to http://anticap.wordpress.com/. Top Silicon Valley executives are accused to conspiring to hold down the wages of up to 1 million high-tech workers. Evidently paying a premium to attract top talent only applies to CEOs. Policies of the New York office of the IRS make things easier for the richest tax evaders. The Federal Reserve System gives member banks free money. Banks charge feels for doing what the law requires them to do. Big pharmaceutical companies pay generic drug manufacturers to keep inexpensive drugs off the market. Economists Michael Hudson and Jeffrey Sommers, in this informative interview with the Real News Network, said that most people in Ukraine will suffer, because the condition for an IMF loan will be lower living standards for a country already poor by European standards, higher taxes and fewer public services and a bankruptcy sale of the Ukraine’s rich farmland and other assets at bargain prices. IMF loans never go to the people of the country receiving the loan. They go to pay off the country’s creditors. An IMF loan to a country is like a debt consolidation loan to a private individual. 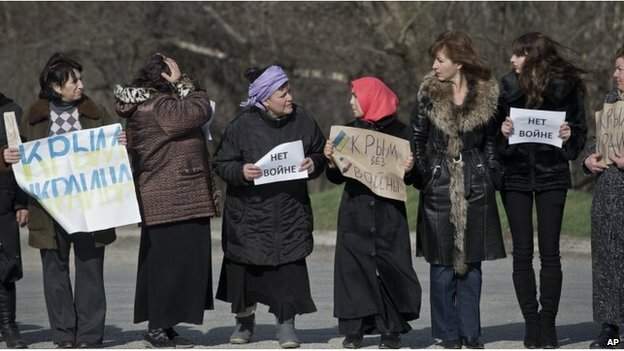 In the case of Ukraine, the country’s creditors fall into two groups — the Russian Federation and its Gazprom natural gas company, to which Ukraine has billions of dollars owing and which no longer will sell Ukraine gas at a below-market price; and banks in western Europe and the United States, which have made billions of dollars in loans to the previous government. Whichever group to which the IMF loans flow (I’m not betting on the Russian Federation), they won’t go to help ordinary Ukrainians. Ukraine will then be in debt to the IMF, which will demand repayment by squeezing the money out of the Ukrainian people and by selling off Ukrainian national assets at bargain prices. Rich Ukrainians may acquire some of these assets. They will be the only Ukrainians who will benefit. Hudson and Sommers pointed out that U.S. energy companies are planning for a disruption in Russian natural gas exports to western Europe, and building LNG (liquified natural gas) terms in U.S. ports so as to be able to sell gas in Europe. I don’t think many Americans are aware of how much of our coal, oil and natural gas production is for export. In particular, I don’t think Americans are as aware as we should be that the pipeline to carry bitumen from tar sands fields in Alberta to oil refineries in Texas is for the benefit of Canadian exporters, not (except very indirectly) American consumers. The tar sands production is being piped south to Texas because other Canadian provinces are unwilling to take the environmental risk of having it piped east or west. In and of itself, anything that reduces the U.S. trade deficit is a good thing, not a bad thing. We need to import things from abroad, and we need to pay for them with exports. Now we pay a price for this, which we did not have to pay for oil exports from Texas in the 1950s. The easy-to-get coal, oil and natural gas has been pretty much used up, and so we need hydraulic fracturing for natural gas, mountaintop removal to dig for coal, deep water drilling for oil and the Alberta tar sands to get at what fossil fuels are left. All these methods involve risks to human health and the natural environment, but that’s a price that can’t be avoided until alternatives are found and energy consumption is reduced. An advanced nation should not depend on exports of raw materials, and imports of high-tech manufacturing goods, but that is the U.S. situation today. As the old saying goes, you can’t have your cake, and eat it too. 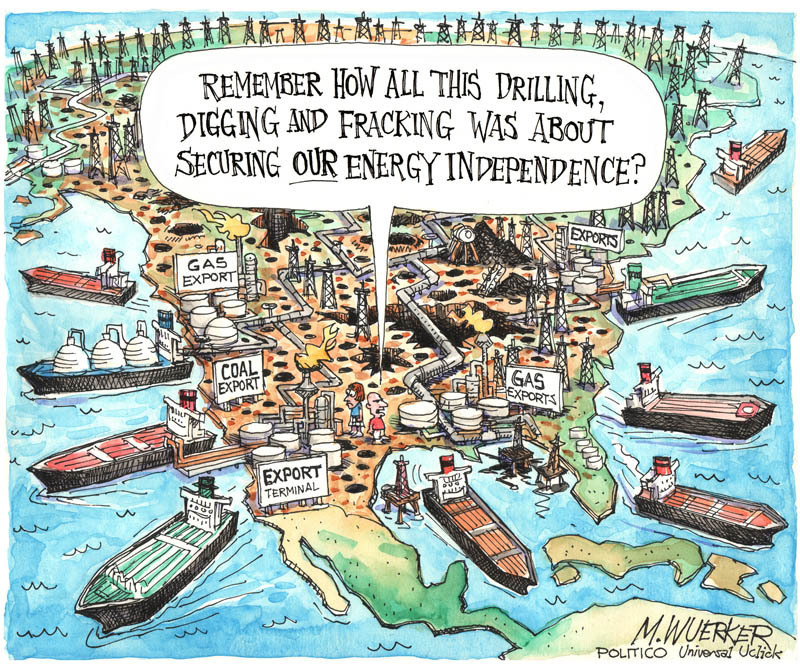 A nation can’t have reserves of fossil fuels, and burn them up or sell them all for export, too. Hat tip to Bill Elwell for the cartoon. 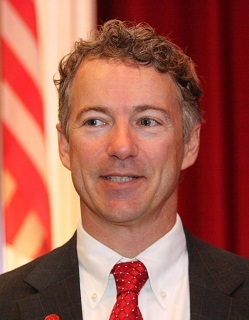 Senator Rand Paul is naive and ignorant, he has an inadequate political philosophy, but he has the heart of a human being. Which is more than you can say for Barack Obama, Hillary Clinton, Ted Cruz, Chris Christie or Paul Ryan, to name a few. He does not allow Orwellian language to blind him to the human reality behind extrajudicial executions, military intervention or preventive detention. He does not justify or protect thieves, assassins or torturers. A couple of years ago he made a fool of himself addressing students at Howard University, both underestimating their intelligence and knowledge and overestimating his own. He made things worse afterwards by whining. Yet how many other Republican politicians would have the guts to open himself up for questions from a predominantly black audience — as distinguished from giving an insulting lecture on the value of the work ethic. Rand Paul is one of the few national politicians who is trying to reform drug sentencing policy, which has, as Michelle Alexander pointed out, resulted in mass incarceration and subsequent denial of civil rights to millions of young black men. That’s more than can be said of Barack Obama, Eric Holder or Hillary Clinton. President John F. Kennedy used to say, “The rising tide lifts all boats.” What he meant was that economic growth benefits everyone. The chart above shows that this once was true, but is no longer so. The links below give some possible explanations as to why this is the case. I’ve written about low wages and poor working conditions at fast-food restaurant chains, but the fact is that a humane business owner who is a franchisee may not be in a position to treat employees humanely. Franchisers of fast-food restaurants impose strict controls on franchisees, including the prices that they charge. So if McDonald’s (to take a hypothetical example) says the price of a double cheeseburger is a dollar, and it costs more than a dollar to make the double cheeseburger, the “owner” of the individual McDonald’s restaurant loses money. I put “owner” in scare quotes because a franchisee does not have the self-determination of a true owner. Under a truly independent business owner, the franchisee is not free to raise or lower prices in response to supply and demand. The effect of unionization of fast-food workers or a higher minimum wage will be to squeeze franchisees while the effects on franchisers at the top of the economic food chain will be minor and indirect. The answer, as Martin Longman wrote in the Washington Monthly, is for franchisees to unionize to protect their own interests. As Longman pointed out, franchisees typically pay thousands of dollars just for the right to the franchise, basic business decisions such as prices are made for them, and they often have to buy basic supplies from suppliers designated by the franchiser. They are in much the same situation as sharecroppers in the Old South in an earlier era, and have just as little ownership rights. Everybody who is in a position to be squeezed by giant corporations — employee, franchisees, suppliers — has a right to organize collectively to equalize the bargaining power. It is not in the interest of franchisees and suppliers to be shock absorbers between these giant corporations and the workers who make their profits possible. If franchisees organize, their organization would of course not be called a “union” . It would be called an “association” or “federation” or something like that. But the purpose would be the same. William K. Blank is professor of economics and law at the University of Missouri at Kansas City, a former bank regulator and author of The Best Way to Rob a Bank Is to Own One (which I haven’t read). Make a lot of loans to people you know can’t pay you bank. Conceal the bogus nature of the loans through fraudulent appraisals. Escape scot-free with your riches when the crash comes. There are two other elements that he doesn’t mention in this particular talk. 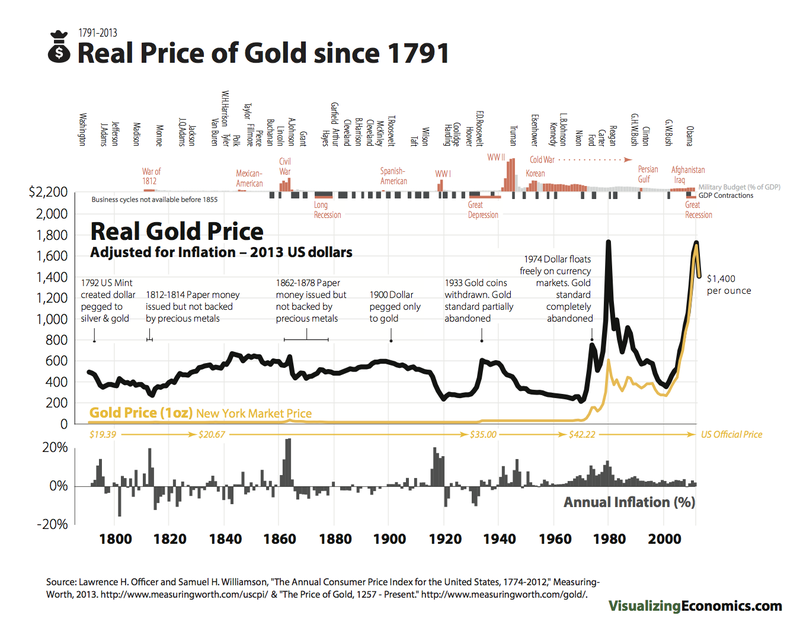 Go to Congress and the Federal Reserve Board to be bailed out when the crash comes. Black said all this has been facilitated for the past 20 years by the Clinton, Bush II and Obama administrations, and by the Federal Reserve Board during that period. Everything is in place for another crash as big as what came before. It seems obvious to me that we Americans need to (1) break up the “too big to fail” banks (those whose assets exceed a certain set percentage of Gross Domestic Product, (2) refuse to insure deposits that are used for risky investment and (3) prosecute financial fraud, as was done in the Bush I administration following the savings and loan crash. America Has Become a “Cheater-Take-All” Nation by Willliam K. Black for AlterNet. 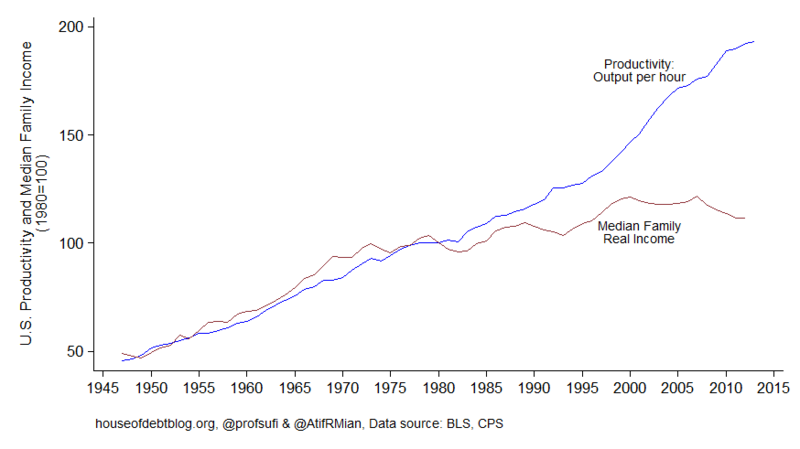 The Big Lie That Haunts the Post-Crash Economy by Dean Stockman for The New Republic. The “big lie” is that “everyone” is to blame for the crash of the housing bubble, when in fact the bubble was mainly due to crooked financiers. New Lawsuit Alleges That Wells Fargo Has a Manual for Mass Fabrication of Foreclosure Documents by Yves Smith. Why Prosecutors Whiffed on Subprime Crime by Barry Ritholtz for Bloomberg View. Hat tip for the video to Yves Smith. I’m 77 years old, and, I can tell you, things weren’t always the way they are now. I’m not saying that life back in the day was better in all respects, but I can remember when people could work in factories, earn a good living and have time left over for their families. This is what a job in America’s new manufacturing industry looks like by Lydia Depillis for the Washington Post’s Wonkblog. How Finance Gutted Manufacturing by Suzanne Berger for Boston Review. I can remember when retail clerks worked for the same store for years and knew their customers personally. My Life As a Retail Worker: Nasty, Brutish and Poor by Joseph Williams for The Atlantic. I can remember when we Americans were took it for granted that all our public utilities worked, and mocked foreign countries where this wasn’t true. Not Just New York: Gas Leaks Are a Problem All Over the U.S. by Francie Diep for Popular Science. I can remember when people didn’t have to worry about information about the details of their lives going into data banks and being used against them. When Health Costs Harm Your Credit by Elizabeth Rosenthal for The New York Times. A vast hidden surveillance network runs across America, powered by the repo industry by Beta | Boston. I can remember when economic growth benefited everyone – rich, poor and the middle class. Wall Street’s 2013 Bonuses Exceeded Total Incomes of U.S. Minimum Wage Workers by Sarah Anderson for Other Worlds. The “Paid What You’re Worth” Myth by Robert Reich. Anyone who cannot answer the last of those questions does not live in a democratic system. Reading differing versions of the Ukraine conflict reminds me of George Orwell’s recollections of the Spanish Civil War of 1936-1939. 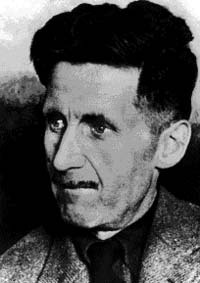 Orwell fought on the government side against rebels led by General Franco and was wounded in action. Soviet Russia supported the government side; Nazi Germany and Fascist Italy supported the rebels. 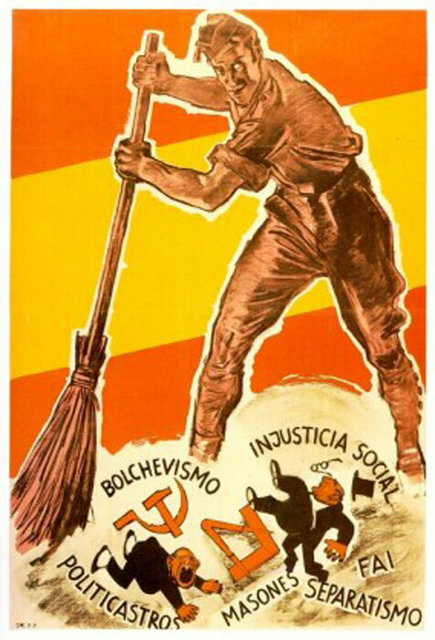 I have little direct evidence about the atrocities in the Spanish civil war. I know that some were committed by the Republicans, and far more (they are still continuing) by the Fascists. But what impressed me then, and has impressed me ever since, is that atrocities are believed in or disbelieved in solely on grounds of political predilection. Everyone believes in the atrocities of the enemy and disbelieves in those of his own side, without ever bothering to examine the evidence. Recently I drew up a table of atrocities during the period between 1918 and the present; there was never a year when atrocities were not occurring somewhere or other, and there was hardly a single case when the Left and the Right believed in the same stories simultaneously. I remember saying once to Arthur Koestler, ‘History stopped in 1936’, at which he nodded in immediate understanding. We were both thinking of totalitarianism in general, but more particularly of the Spanish civil war. Early in life I have noticed that no event is ever correctly reported in a newspaper, but in Spain, for the first time, I saw newspaper reports which did not bear any relation to the facts, not even the relationship which is implied in an ordinary lie. I saw great battles reported where there had been no fighting, and complete silence where hundreds of men had been killed. I saw troops who had fought bravely denounced as cowards and traitors, and others who had never seen a shot fired hailed as the heroes of imaginary victories; and I saw newspapers in London retailing these lies and eager intellectuals building emotional superstructures over events that had never happened. Out of the huge pyramid of lies which the Catholic and reactionary press all over the world built up, let me take just one point — the presence in Spain of a Russian army. Devout Franco partisans all believed in this; estimates of its strength went as high as half a million. Now, there was no Russian army in Spain. There may have been a handful of airmen and other technicians, a few hundred at the most, but an army there was not. Some thousands of foreigners who fought in Spain, not to mention millions of Spaniards, were witnesses of this. Well, their testimony made no impression at all upon the Franco propagandists, not one of whom had set foot in Government Spain. Simultaneously these people refused utterly to admit the fact of German or Italian intervention at the same time as the Germany and Italian press were openly boasting about the exploits of their ‘legionaries’. 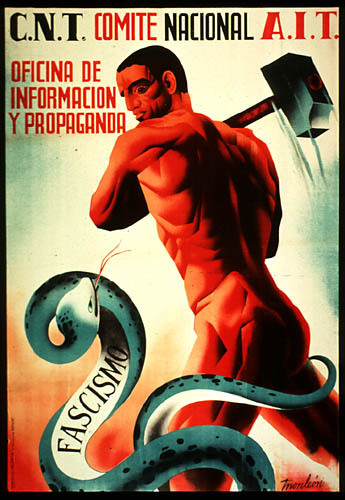 I have chosen to mention only one point, but in fact the whole of Fascist propaganda about the war was on this level. This kind of thing is frightening to me, because it often gives me the feeling that the very concept of objective truth is fading out of the world. After all, the chances are that those lies, or at any rate similar lies, will pass into history. How will the history of the Spanish war be written? If Franco remains in power his nominees will write the history books, and (to stick to my chosen point) that Russian army which never existed will become historical fact, and schoolchildren will learn about it generations hence. This prospect frightens me much more than bombs — and after our experiences of the last few years that is not a frivolous statement. The legal basis of authority in the United Kingdom are different. Legal authority stems from the monarchy, based on the divine right of kings, and the powers that the monarch over the years has ceded to Parliament. The UK has no written Constitution and no Bill of Rights, only royal charters and grants of privileges. American patriotism is defined as the obligation to uphold, protect and defend the Constitution of the United States against all enemies, foreign and domestic. British patriotism is true allegiance to Her Majesty Queen Elizabeth, her heirs and successors, according to law. I recently happened to come across an odd but interesting book, THE ENCHANTED GLASS: Britain and Its Monarchy by Tom Nairn, which says that it does. Nairn argues that the British monarchy is not a mere anachronism, but the core of what gives Great Britain its particular social structure and its identity as a nation. What harm does this do? As far as Nairn is concerned, a lot. It creates a habit of deference to authority instead of the suspicion of unchecked power appropriate to a free people. And it creates a habit of deferring to the upper classes, of regarding their manners and their speech patterns as the standards to be followed. Nairn pointed out that the royal family was not always worshiped as it is now. In the 17th century, the British be-headed King Charles I and replaced him with a short-lived republic. Later, in what was called the Glorious Revolution, they drove out King James II and invited the Dutch William of Orange to rule as a partner with Queen Mary. The Glorious Revolution, according to Nairn, put in power a ruling elite that continues to these day — an alliance of landowners, bankers and merchants who have a talent for imperial rule, but not for managing an industrial economy (which didn’t exist in 1688). The cult of the royal family was consciously built up by politicians and aristocrats as a bulwark against popular sovereignty. The British people came to not only revere the royal family, but to regard their upper-class lifestyle, manners and accents as marks of superiority. It is not happenstance, Nairn said, that Britain was one of the last western European nations to adopt universal suffrage. On the other hand, he wrote, the British monarchy is perfectly compatible with the rise of the Labor Party. 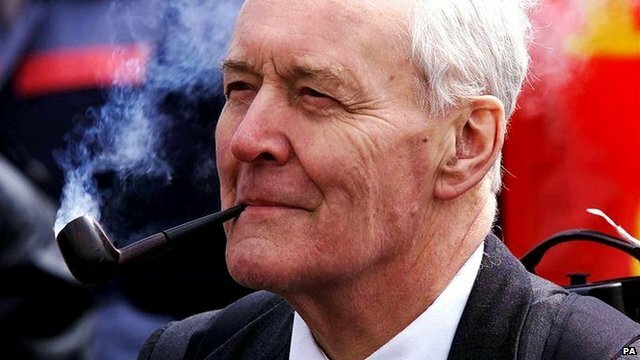 The existence of a party that represents the working class does not threaten the British class system. If anything, the system was threatened much more by Margaret Thatcher’s Conservatives, who reduced everything to questions of money and gave the ruling elite a rationale for abandoning any sense of social responsibility. As I read the book, I thought of how the British system as described by Nairn facilitates abuses of power — growing inequality, an out-of control financial elite hiding behind government, an out-of-control surveillance state hiding behind secrecy. But then I thought about how our American system, based on a very different history and theory of government, is just as bad or maybe worse. So I’m not sure to what degree Nairn’s claims of British exceptionalism are true. We Americans, with our written constitution, our separation of powers and our creed that “all men are created equal,” ought to be able to better resist authoritarian government and the rule of a hereditary aristocracy of wealth. We who believe in liberty and democracy at least have a standard to which we can appeal. Whether this will mean anything in practice remains to be seen. An important positive aspect of allegiance to the royal family is that it is a form of unity not based on race or ethnicity. The United Kingdom came into existence before the rise of nationalism based on common ancestry and language. The royal family was the focus of loyalty for three nations, England, Scotland and Wales, and the ruling class of a colony, Ireland. Later the royals became the focal point of the British Empire which, at its height, encompassed one quarter of humanity, from India to Nigeria, the Falklands and the Yukon. Even today loyalty to the crown binds together a diverse people — which is a good thing, not a bad thing. Without loyalty to their 16th century monarchy, the British would have no basis of unity or identity, just as we Americans would have no basis of unity or identity without our loyalty to our 18th century Constitution. It is possible for nations to reinvent themselves. The Germans did after World War Two. But I am unable to imagine what new basis there could be for either British or American nationality. The Enchanted Mirror was first published in 1989, with new editions in 1994 and 2011. Click on A Republican Monarchy? England and revolution for Nairn’s foreward to the 2011 edition. I have been trying for a couple of weeks to educate myself about the political conflict in Ukraine, and I am not sure even of basic facts. Consider these two articles, each of which I would believe contained the truth, the whole truth and nothing but the truth, if I hadn’t read the other. 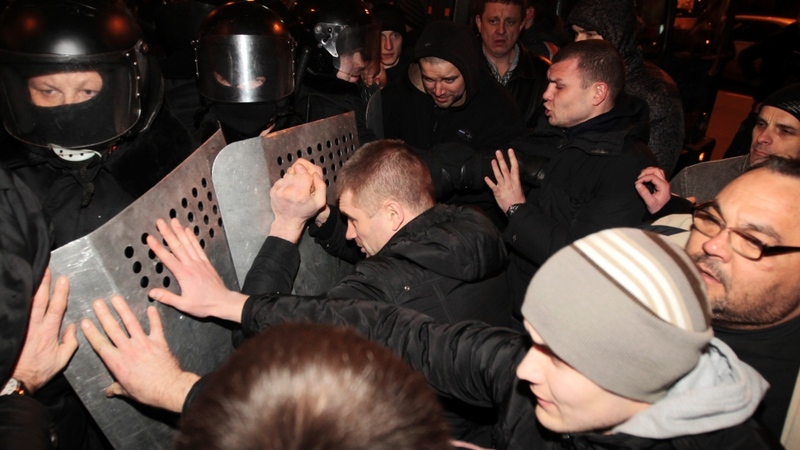 A Petition by Scholars: Don’t Brand Kiev Maidan Protestors as Extremists. The Crimean “Crisis” and Western Bias by Outlook Zen. Hat tip to ClubOrlov. About the only thing I feel sure of is that the Russian Federation, United States and other governments are trying to turn the Ukrainian political factions into their proxies in their global competition for geopolitical and economic power.